have put together a contract for route optimisation which is also open to other Northern Ireland Councils to join. include many of the requirements for their Route Risk Assessments. RouteSmart is the World’s leading GIS based route optimisation solution based on ESRI technology (www.esri.com). Deployed to over 75 UK local authorities and their contractors, RouteSmart enables these organisations to optimise routes driving through efficencies and cost savings via fleet reduction, reduced mileage and more time balanced routes / shift patterns. 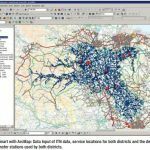 RouteSmart software is also used in the postal service and utility sectors and is continually being developed by RouteSmart Technologies Inc (www.routesmart.com). Integrated Skills Limited, operating internationally out of Romsey near Southampton, is a specialist provider of routing and optimisation software solutions as well as environmental consultancy. ISL’s routing and optimisation software solutions reduce transport costs, improves productivity (improved drop density, reduced costs per drop, etc) and maximises efficiency through reductions in fleet size, mileage, planning time/resource and can also be used for scenario planning when introducing new orders, customers, vehicles, routes and services. ISL is a partner of RouteSmart Technologies Inc.™ (www.routesmart.com) for high density, door-by-door and street-by-street route optimisation software as used by local authorities and their contractors for waste & recycling services, winter maintenance, street cleansing, gully emptying, grounds maintenance, social care transportation and similar services. The software is also used in the postal services, newspaper distribution and utilities sectors. WinRoute is one other routing solution deployed by ISL and is from the extensive portfolio of Canadian based Descartes Systems Group™ (www.descartes-systems.com). ISL is the UK’s leading reseller of Descartes’ vehicle routing and optimisation portfolio which includes WinRoute, Routeplanner, Routeplanner OnDemand and RoadShow.